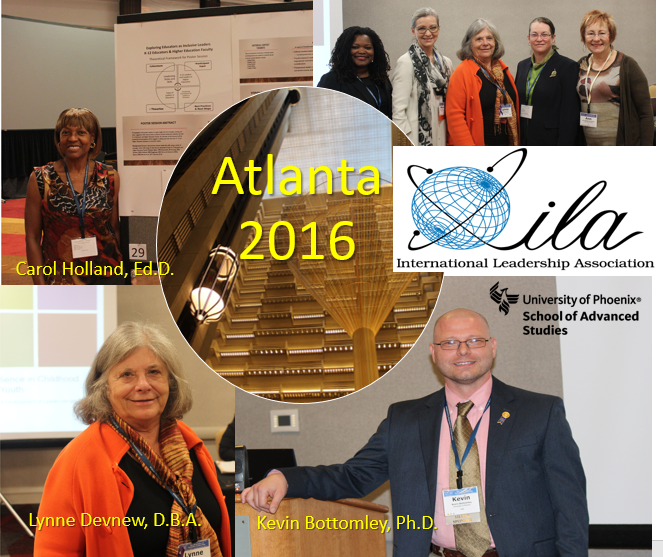 While the number of University of Phoenix presenters at this year’s 2016 Annual International Leadership Association (ILA) Atlanta conference was small, their scholarship made big gains and much visibility. From a new book about leadership, social change, and the arts, to strategies on inclusive leadership and training, to women and their development of leadership identify, School of Advanced Study (SAS) faculty panelists and presenters were well received. Lynne Devnew, senior research fellow, Center for Leadership Studies and Educational Research (CLSER) was among five key panel contributors who used an iterative process of collaborative auto-ethnography to share the view of young women’s perceptions of resiliency influences on their leader identity. The study, Resilience in Childhood and Youth: Women’s Development of Leader Identity featured Devnew, Chanda D. Elbert, associate professor, Agricultural Leadership, Education and Communications, Texas A&M University, Ann M. Berghout Austin, professor and director, Center for Women and Gender, Utah State University, Marlene Janzen Le Ber, associate professor & chair, School of Leadership & Social Change, Brescia University College, and Judith B. LaValley, doctoral candidate, Industrial and Organizational Psychology, Kansas State University. For more information or to join Dr. Devnew’s work on women and leadership issues registered CLSER affiliates can visit her forum. Carol A. Holland, associate faculty, SAS was on hand to share her current research effort entitled, Exploring Educators as Inclusive Leaders: K-12 Educators and Higher Education Faculty. Dr. Holland’s study zeros in on the type of training needed to boost inclusive leadership, a prominent theme at this year’s conference. Her focus includes a four prong approach at the intersections of the literature on leadership style and skills, key theories on the types of leaders in education, gathering participant input among K-12 and higher education leadership, and best practices for leading. Holland’s work is on-going and she looks forward to presenting final results at future conferences. In a third university showing, Kevin S. Bottomley, lead faculty area chair, SAS, was part of a panel discussion among the editors of new ILA book, Grassroots Leadership and the Arts for Social Change, available April 2017, BLB Volume. According to the ILA 2016 conference program, “Throughout history artists have led grassroots movements of protest, resistance, and liberation. Their efforts kindled a fire, aroused the imagination, and rallied people, culminating in real transformational change.” Dr. Bottomley, a chapter contributor, maintains that grassroots leadership and the arts have a profound effect on social change. He was joined by other book contributors Susan Erenrich, professor, American University; professor, New York University, Garth Ross, vice president, community engagement, The John F. Kennedy Center for the Performing Arts, and Joshua Hayden, director of executive programs, Lipscomb University. What’s next? Start preparing your scholarship for submittal and make your prominent academic and networking mark at next year’s ILA 19th Annual Conference dubbed Leadership in Turbulent Times, set for Brussels, Oct 12-15, 2017. Stay tuned for further announcements from Erik Bean, Ed.D., associate university research chair, CLSER, and past ILA conference contributor, to support your proposal progress via webinars as well as a prospective partial scholarship financial incentive if accepted. In the meantime, please congratulate this year’s outstanding ILA annual conference contributors Devnew, Holland, and Bottomley!